If you work offshore on oil platforms, the Outer Continental Shelf Lands Act is vital to helping you obtain compensation after a workplace injury. Enacted in 1953, the OCSLA extends the Longshore and Harbor Workers’ Act to maritime workers injured or killed on offshore oil rigs. 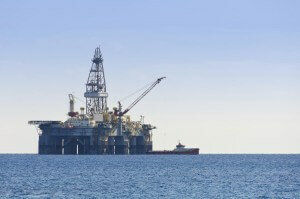 The Gulf of Mexico teems with oil platforms working day and night in harsh ocean conditions. Combined with the dangerous nature of oil platform labor, injured workers should consider deploying the Outer Continental Shelf Lands Act for Maritime Claims around Texas. What is the outer continental shelf? If high school world geography was many moons ago, we can refresh your memory. A continental shelf is the underwater landmass that extends from a continent. This shelf results in a relatively shallow water sea, like the Gulf of Mexico. This shallow sea takes on political and legal meaning in the United States. The Outer Continental Shelf (OCS) defines political boundaries that separate state and federal jurisdiction. The Gulf of Mexico OCS boundaries are different for Texas and Louisiana. The maritime attorneys at Richard J. Plezia & Associates understand these differences and the impact it can have on using the Outer Continental Shelf Lands Act for maritime claims around Texas. After an injury, the act provides full medical and wage benefits. Oil platform workers can use this act to provide medical recovery and keep the paychecks coming while you recover. Keep in mind that an employee or dependent must give written notice to the employer within 30 days of the date of injury, or within 30 days after the employee becomes aware of the injury. The statute of limitations for filing a case extends to one year of the injury. Oil platform work is no easy job, and many rig workers are injured. Don’t ignore an injury or small accident. Even a minor injury left untreated can lead to permanent damage. If you have been injured while working on an oil platform, contact the Houston maritime law lawyers at Richard J. Plezia & Associates. They understand the intricacies of Outer Continental Shelf jurisdiction, and can use the OCSLA compensate you and your family after an injury.